Red beans slowly simmered with a smoky ham hock until they absorb all of its flavour before being served over rice in one flavour packed meal. Beans and rice is a classic combination with different versions showing up in various cuisines from around the world. One of my favourite versions at the moment is this Cajun style red beans and rice dish which is pure comfort food and it has been a perfect fit over the last few weeks with the continuing cold weather. Though you could easily keep this dish vegetarian, I could not resist adding some andouille sausage to make it even heartier and add some more flavour. Speaking of flavour, another great way to build some up is to add a ham hock to the pot while everything simmers. A ham hock is generally smoked and cured and it will add a ton of flavour to any dish that it is cooked in. The ham hock does contain meat and after all of the simmering is done you can pull it from the bone and add it to the dish that you cooked it in if you wish. With all of the main ingredients in place that leaves the basics which include onions, celery, green pepper, garlic and chicken stock . From there, the Cajun flavours are built up with some ingredients commonly found in Cajun spice blends including paprika, oregano, thyme and some cayenne pepper for a bit of heat. The key to this dish is of course the long simmer and if you have the time, let it simmer for a while. Once the beans are cooked you simply serve them over the rice. You could also keep things simple and mix the rice right into the beans or you could get a bit fancier and form the rice in a small greased bowl like I did in the photo. Heat the oil in a large sauce pan over medium heat add the sausage and saute until lightly golden brown, about 5-7 minutes, and set aside. Add the stock, beans, ham hock, sausage, paprika, cayenne, oregano, thyme, bay leaves, salt and pepper and bring to a boil. Reduce the heat to medium-low and simmer covered for at least 1 hour continuing for another hour or two if you have the time to bring out more flavour from the ham hock. Mash or puree about a quarter of the beans. Option: For One-Pan: Make this a one-pan meal by adding 1 cup of rice and 2 cups broth or water (or 8 ounces of pasta and 2 1/4 cups broth or water) to the sauce after step 5 and simmer, covered, until cooked, about 20 minutes (or 12 minutes for pasta). Slow Cooker: Implement step 1, optionally implement steps 2 & 3, place everything except the rice in the slow cooker and cook on low for 6-10 hours or high for 2-4 hours. I have a soft spot in my heart for beans and rice. It's one of those meals I can always eat. The ultimate cheap meal and so unbelievably delicious. Great post and fantastic recipe! This time of year, I'm always craving the flavors of NOLA! I don't know if it's the warmth and comfort, or anticipation of Mardi Gras, but it just seems to fit. 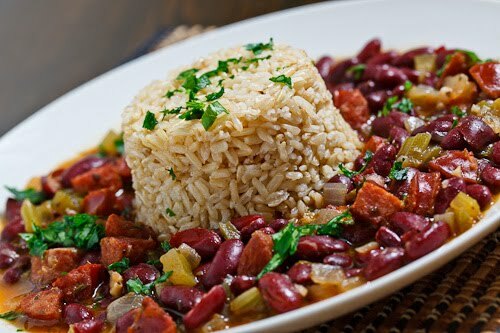 These red beans and rice look perfect for the occasion! Great picture! I love red beans and rice! It's so packed with great flavor and gets even better as a leftover. Beans and rice is the ultimate comfort food for me. I love the colors going on in this dish. Your photo is spectacular. Looks yummy. What about rice and peas? Another classic. I have tried to make it but it never is the same as I get at Mr. Jerk. Sorry…I have jerk on the brain after eating it at lunch today. This is a delicious way to stretch a dollar for dinner! Good red beans and rice are awesome comfort food… especially if the weather keeps being nasty! Hope spring is on his way in your neck of the woods too! This recipe is definitely a classic…can't get any simpler (or more delicious!) than beans and rice! Nice to see your recipe. We doubt we've ever made our red beans the same way twice! I never would have believed it. An attractive version of red beans & rice. Always delicious, but never looking so good. Nice plating @ photography! Hi Kevin! This recipe you have here is great. Red beans and rice is one of my favorite things to cook. I use this version of the recipe since it turns out great. I'm looking forward to trying yours! telesma: Good tips! I do have some cayenne in there but hot sauce would also work. This is the type of food I grew up on so, I know you enjoyed yourself eating the food there. Great post. I like to make red beans and rice with small red beans rather than kidney beans (creamier texture), but I love the look of the kidneys in this picture! this looks amazing but it says cook 1-3 hours that's a big difference in time … how do you determine when its done ? Wintry Kiss: This is one of those dishes that gets better with more time on the stove as it allow more flavour to be pulled from the ham hocks. If you only have 1 hour then pull it off the stove then but if you can go for more simmer time. WHEN do you add the cooked sausage? CreekHiker / HollysFolly: Good catch! You put the sausage in with everything else in step 5. I fixed the recipe. That's what I did…turned out awesome! I had some Manda sausage I brought home from LA…so good! This looks delicious! I'll have to make it sometime. Please visit my blog if you'd like! So I made this recipe this weekend…OMG!! My husband's words were "This is definitely a keeper". I did double up on the ham hock though. It was a two-pack and I couldn't think of anything else I'd need a ham hock for in the near future. Anyway, thank you so much, Kevin!